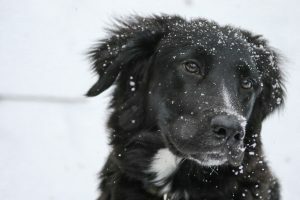 Whether you’re a new dog owner or you’ve owned dogs most of your life, you may wonder whether you can give your dog a bath in the winter. If you find yourself asking that question, rest assured that the answer is yes. You can and often should bathe a dog in the winter, as long as you know how. Bathing a big dog is pretty much the same as bathing a small or medium-sized dog in the winter. Once you master one size dog, you should be able to handle dogs of almost any size as long, as you have enough supplies and can lift the dog into and out of the tub safely. Remember — no matter how big or small a dog is, it’s never a good idea to let them jump into or out of a tub on their own, because slippery surfaces and wet paws that can slide may lead to serious injuries. If you normally bathe your dog outside using your hose during the warmer months, you’ll probably have to adjust your routine during the winter, as it might be too cold to bathe your dog outdoors. Like humans, dogs can suffer from hypothermia, so it’s vital that you only wash your dog under the proper conditions when it’s cold. This usually means bathing your dog indoors in a warm environment. Control air temperature: The first step is to make sure your home is warm before, during and after your dog’s bath and until your pet is completely dry. If your home doesn’t have central heat, use a space heater to keep the bathing area warm and allow your pet to dry off after. Maintain water temperature: Only use warm water to bathe your pet. While your dog might enjoy splashing around in cold bath water when it’s hot outside, it’s unsafe to wash your dog with cold water during the winter, especially if they normally have to relieve themselves immediately after getting a bath. If your dog must go to the bathroom after getting a bath, make the trip outdoors as short and close to home as possible. Prepare warm towels: Before you bathe your dog, warm up some thick towels in your dryer. After the bath, let your pet shake excess water from their coat. Then, use the towels to absorb remaining water from their fur and body. Prepare for post-bath: Make preparations to keep your dog inside until they are completely dry. In general, it’s wise to bathe your dog early in the day — especially if they have thick fur — so they’ll be dry before their evening walk. Adapt to the animal’s lifestyle: If you have a dog that lives outside, you can still give them a good cleaning, even when it is too cold to bathe a dog outdoors. You can use a dry shampoo to avoid getting your pet wet. Find a quality washing location: If you want to wash your dog on your own but don’t want to run the risk of clogging your tub’s drain with pet hair, you should find an All Paws Pet Wash station near you. Washing your dog at a self-serve pet station is safe, fun and hassle-free. You don’t even need to bring your own shampoo when you bring your dog to an All Paws Pet Wash! Use our Find a Pet Wash Site locator now! If you have an entrepreneurial spirit and love animals, you may want to start your very own self-serve pet-wash business in your community. All Paws Pet Wash makes realizing your dream of becoming a business owner easy and affordable. If you want customizable options, a full line of products and excellent customer support, you couldn’t ask for a better partner than All Paws Pet Wash.
To learn more about the self-serve pet-wash options we provide, contact All Paws Pet Wash today!